TAMPA, Fla. (AP) - One elite player and a rookie came up big for the slumping Tampa Bay Lightning. Vincent Lecavalier scored with 41.6 seconds left in the third period and newcomer Karri Ramo made 31 saves to lead the Lightning past the Toronto Maple Leafs 2-1 on Thursday night. Lecavalier's goal came from the lower right circle off a pass from Martin St. Louis. 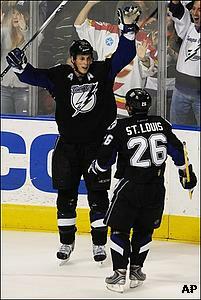 Jason Ward also scored for the Lightning, who snapped a three-game losing skid. "Just to get a win, it definitely feels good," Lecavalier said. Matt Stajan scored for Toronto, which lost its third straight. "We are playing well enough do better, but at the end of the day it's not happening for us," Maple Leafs coach Paul Maurice said. "Our goaltending has been real good. It's just tight when you're not scoring." Ramo made his first career start one day after he was recalled from Norfolk of the AHL. Lightning starter Johan Holmqvist, pulled from three of his last four starts, is 13-12-3 this season with a 3.02 goals-against-average and .888 save-percentage. Backup goalie Marc Denis has dropped five of six decisions and has a 4.05 GAA. The Maple Leafs took a 1-0 lead at 16:36 of the second when Stajan's shot from along the left-wing boards deflected off Tampa Bay defenseman Doug Janik in the low slot. Ramo turned aside a good scoring chance by Mark Bell, and on the ensuing rush, Ward tied it off a pass from Lecavalier with 1:19 left in the second. Sullivan filled in for coach John Tortorella at the postgame media session. The team said Tortorella was involved in a meeting. "He's been playing great," Stajan said. "I don't think we can say enough about Vesa's play. He's giving us a chance to win every game." Ramo was not severely tested during the first half of the game, but did stop Mats Sundin's shot from the right circle on a late first-period Toronto power play. He made several strong saves, including an in-close try by Boyd Devereaux. Tampa Bay had dropped five of six. Lightning center Craig MacDonald was hit in the mouth by Toronto defenseman Hal Gill's shot with 1:57 left in the third. The Lightning said MacDonald lost several teeth, and had mouth and tongue lacerations. Notes: Ramo made two relief appearances for the Lightning last season. ... Tampa Bay D Brad Lukowich (shoulder) did not play. ... Devereaux had his three-game goal streak snapped. ... Peter Puck, the popular intermission animated character on U.S. national hockey broadcasts in the 1970s, returned to TV as part of the Maple Leafs broadcast. The team said it was the first time Peter Puck has been used on the air in 28 years.